The same goes for drawing. 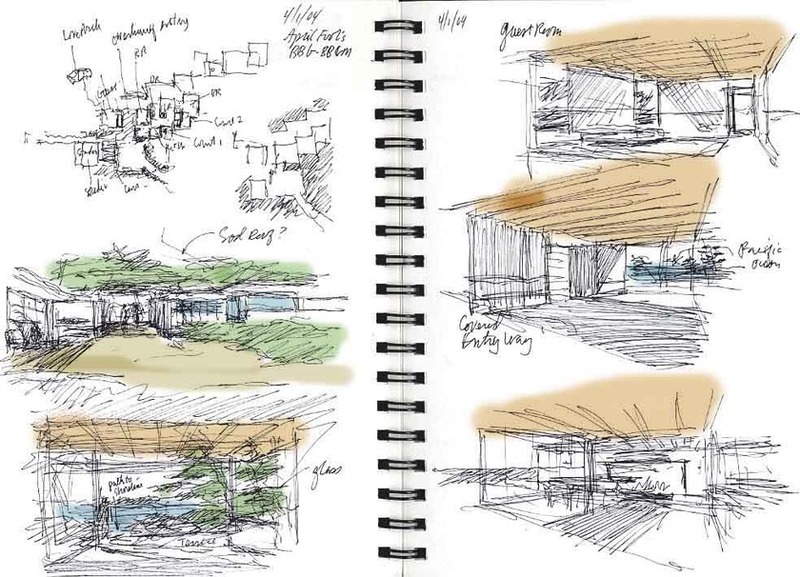 Yes, architects are supposed to draw well, and many of the greats have always done so, but some of the greatest use nothing more than scribbles to communicate their ideas to workshops of apprentices (think Frank Gehry, Louis Kahn...) and this is as it should be. Why? Because over-drawing--drawing too realistically or too sentimentally--discourages the accidental discoveries vital to the design process and miraculously present in the final work of art. I say "miraculous" because it is nothing short of miraculous when an architect--or painter, or musician, or sculptor--spends hundreds of hours on a work which manages to transcend both its materials and the tedious steps involved in making it. Said another way, there is a kind of magic in every work of art: it's usually impossible to look at it and understand how it was done. Here is a house I am designing for a best friend who is moving to Big Sur, Caifornia. The site is on the water, and when you're there, all you are conscious of is the sun on your skin, the warmth you feel when the chilly wind stops blowing, and the sound of the Pacific at the western edge of the property. So why do these design sketches look so "bad" (considering I'm a "renderer")? Because it's not about making pretty drawings at this stage; it's about maximizing the chances that your pen will slip and lead you to a bunch of accidental discoveries that defy logic and keep the end product magic. Realistic drawing skills and math only get in the way of the process. Does an aptitude for drawing and math help? Yes, but not beyond a 7th or 8th grade level, at best.